Alleviate the financial stress associated with your pet's unexpected medical expenses and generate funds for our shelter at the same time! 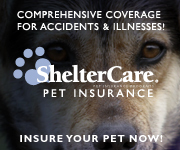 Simply apply for a ShelterCare Pet Insurance Program by using the ShelterCare banner-link. Here's how it works: ShelterCare Pet Insurance Programs cover you when your pet needs essential veterinary care from an illness or injury. Every time a completed application for a ShelterCare program is generated through our shelter's website, we automatically receive a $25 donation to help cover common needs like blankets, litter and food. This donation is of no cost to you and provides us with essential funds. Make the right move and enroll today!